OK who didn't see this coming (I mean besides Carol)? Search is not important to Yahoo, they proved that when the passed it over to Microsoft. 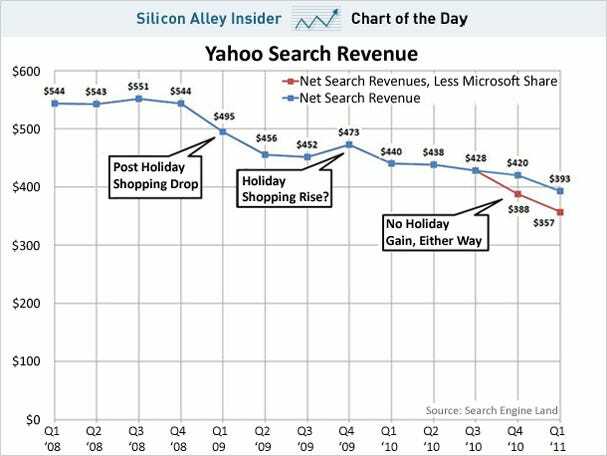 Yahoo's tanking search revenue (down 19%) ruined what would have been an otherwise strong earnings report last night. Carol Bartz blamed sliding search revenue on Microsoft's adCenter not delivering high enough revenue per search -- her implication is that the ads aren't as relevant as they were under Yahoo's system, so users aren't clicking on them as much.